It’s officially Fall in Michigan. Aside from the classic favorites like cinnamon donuts, honey crisp apples, and hot cider, we also know it’s the ultimate season for fresh collard greens. Why you ask? Because farmers and consumers alike love to pick collard greens out of the ground after the first frost. You see, the toughness of collards breaks down in extreme temperatures. Collards cook much quicker once they’ve been dusted with a light frost. The same holds true with these nutrient-dense greens and extreme heat. They break down much faster and reduces the cooking time when cooked over high heat. 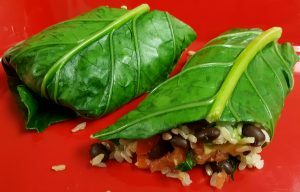 Want to use your beautiful fresh collard green leaves in a non-traditional way? 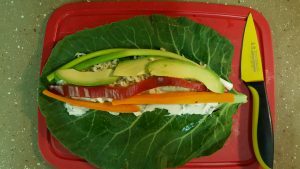 Consider these ideas: Mexican Collard Green Burritos or Collard Green Veggie Wraps. Either way, you won’t be disappointed! These big, bold beautiful leaves are not only tasty, but full of nutrients that will prepare your body for the season. Collards are in the same family as kale and cabbage. This leafy green powerhouse is loaded with vitamin C, vitamin A, and vitamin K. They’re leaves and stems are also packed with vital minerals such as iron, calcium, copper, manganese, selenium, and zinc. Whether you get your greens from your local grocery store or out of your own back yard, collards are a tasty, nutrient-dense addition to any meal.